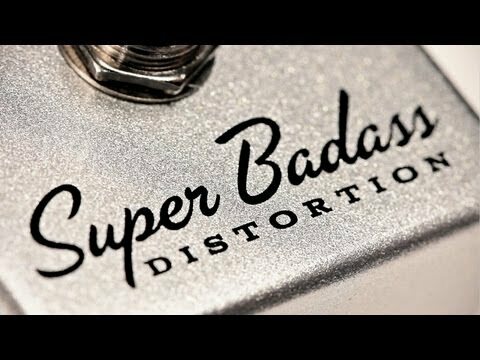 The Jim Dunlop MXR Super Badass distortion pedal comes from a stable that has a reputation for building high-quality products, having previously won awards for their ’78 Distortion and Modified O.D. pedals. The Jim Dunlop MXR Super Badass features a new gain circuitry design with the potential to boost the pre-distortion gain up to an enormous 60dB. The circuitry actively reconfigures its frequency response at varying levels in order to ensure that your guitar’s clarity and presence shines through, whether you’re playing quietly in your bedroom or melting faces on stage. Rather than having a single EQ option the designers have instead elected to pass creative control over to the guitarist by including individual tone selectors for Bass, Mid and Treble. Each tonal option has a mastery over its frequency range. Bass can be set from tightly clipped to a resourceful boom, Treble can let you accentuate the higher sonic range then take you screaming to the heavens. Mid complements both for a fuller sound, or you can easily scoop it out for some true Thrash-style wailing. However, even with these increased options the pedal is still delightfully simple to use, making the quest for great tone even easier. Whether you favour a Strat or a Les Paul, single-coils or humbuckers, this pedal has been put through its paces by its designers to ensure that whatever your setup or preferred style of music is, you can get a killer tone every time!